Isaac S. Tyndale was born in Newpaisley, province of Quebec, Canada, January 18, 1855, and was sixth of eleven children in the family of Mathew and Eleanor Tyndale, who had five sons and six daughters. The Tyndale family date back to the Tyndales of England to the time of William Tyndale of the year 1500, and they have been especially known in church and educational work. Our subject was raised on a farm in Canada where his family were known as pioneers, and where his parents died at an advanced age in the city of Montreal. This immediate family were pioneers in church extension and local work. Isaac Tyndale grew up to his younger manhood days on the home farm and received a common school education, and in his twentieth year left the home in Canada and came to Central City, Nebraska, engaging in the dry goods trade in the fall of 1879. He is one of the first of Central City's merchants, and at this time Mr. Tyndale is the oldest merchant in point of trade service in Central City, having been continuously in the mercantile business until this date. Mr. Tyndale is a representative citizen, and has served the people of his community and county in different capacities. In 1886 he was elected commissioner of Merrick county, and in 1894 he was elected by his constituents to the office of mayor of Central City, Nebraska. In fact, he has been active along all political lines, being a staunch republican, and has always stood for purity in politics and for the upbuilding of his home town, county, and state. He was appointed postmaster at Central City in 1907, an unsought honor and made an acceptable official. Mr. Tyndale is active in church and social circles, and is connected with numerous fraternal orders. On May 11, 1889, in Central City, Mr. Tyndale was married to Miss Ada Simpson, a native of Wisconsin, who became a resident of Central City in 1882. Mr. Tyndale has been connected with farm and stock interests, and is also a land owner. He is still conducting a large mercantile business, and is prominent along all lines. It would be impossible to give a sketch of the history of northeastern Nebraska without including in the same a review of the career of Mr. S. L. Whitmore, who is numbered among the most prominent of the early settlers. Mr. Whitmore is a native of Vermont, born at Ira, October 28, 1840, a son of Edmund and Henrietta (Welmarth) Whitmore. He grew up there, and when twenty-one years of age enlisted for three years in Berdan's First Regiment, United States sharpshooters. This was September 11, 1861. He was with his regiment all through the east and southeastern part of Virginia during his term of service. July 1, 1862, at Malvern Hill, Virginia, he was wounded during the seven-day fight, and was discharged September 11, 1862, at Philadelphia, because of disability. Other engagements in which he participated were: Big Bethel, Yorktown, Williamburg, Fair Oaks, Gaines Mill, and Cold Harbor. After returning from the war Mr. Whitmore made his native county his home for about seventeen years, then struck out for the west to make a home for himself and become a land owner. His first stopping place was Columbus, Nebraska, where he only spent a short time, driving from there to a homestead which he selected in Knox county. There he erected a sod house and occupied that for some time before replacing it with a frame dwelling. He went through every form of frontier life, suffering at times loss of crops, destruction of his property by prairie fires, and from storms, etc., but stuck to his determination to win for himself a competence, and his present finally equipped farm is good evidence of his wisdom in remaining. At the present time he is the owner of a tract comprising six hundred and forty acres, well stocked, and much of it under cultivation. He has fifteen acres of fine trees, besides orchards and many beautiful shade trees on every part of the farm. Mr. Whitmore was united in marriage to Miss Octavia Parks, January 1, 1863, and they became the parents of three children: Helen A., now the wife of Henry W. Wellman, of Knox county; Henrietta, who was the wife of C. T. Anson, but is now deceased; and S. Bertrand, who owns one hundred and sixty acres formerly owned and operated by his father. He married Nauna Carson, of Pilger, Nebraska, and they have two children. January 25, 1911, Mr. Whitmore suffered the loss of his wife. They had been married forty-eight years. Mr. Whitmore has always evinced an active interest in local affairs pertaining to the betterment of conditions, aiding in every movement for promoting the growth and development of the natural resources, etc. During the years 1892 to 1895, he served as county commissioner, and for two years as chairman of the board. He has also held other offices in his township. He was the first postmaster at Venus, and served for thirteen years. Christopher C. Ridell, deceased, was born in Saxony, Germany, August 8, 1835, and at the age of two years came to America with his parents. He was the eldest of five brothers and one sister, and the only child born in the old country. The family settled in Ohio, and on reaching young manhood, Christopher engaged in gardening and farming near Columbus, where he was married in February, 1856, to Lucretia Johnson, of that city. Four children were born to them: Mariette, Charles, Margie, and Charlotte F., all married and settled in different parts of the country. Mr. Ridell came to Hall county, Nebraska, in 1858, and started a saw mill which he ran for a number of years, furnishing lumber for the first houses erected in Grand Island, also in the surrounding towns in that region. He later homesteaded eighty acres near Dannebrog, Howard county, and after passing through the various phases of pioneer life succeeded in building up a fine farm and home. Mr. Ridell was a soldier in the civil war, enlisting in the Second Nebraska Volunteer Cavalry, Company B, in 1863, and serving until the end of the war, being in Nebraska all of the time. He took part in many skirmishes and has a good record as a faithful soldier of his country. In 1881 Mr. Ridell came to Nance county and resided there up to the time of his death, which occurred on November 30, 1898. He had married Miss Candace Cole, at Loup City, Nebraska, in December, 1876, and to them were born three children: Winnifred M., who married Herbert Huff, parents of three children, residing in Montana; Edith I., wife of W. L. Rose, an attorney, they having two children, and living in Fullerton; and Artemus F., of Fullerton. The Ridells also raised and educated a niece, Lenora Ridell. Since the death of our subject his widow has resided in the town residence in Fullerton, where she and the entire family have a large circle of friends. Mr. Ridell was a man of sterling character, an earnest christian, and in his demise the entire community sympathized with the family. One of the earliest settlers of the present county of Boyd, and one who has lived within the boundaries of the county since coming into the state, is Davis H. Briggs, who is running the largest and best equipped livery establishment in Naper. He first came to Boyd county in June of 1883, when he filed on a pre-emption claim between the Niobrara and Keya Paha rivers in the part of Boyd county that was at that time attached to Holt for administrative purposes, and on which he settled in March, 1884. In 1885, he bought a quarter section, and in 1886 filed on a timber claim. He lived on his farm until 1896. That year the late Indian lands in the west end of the county were being settled up more rapidly, and Mr. Briggs came to where Naper now stands and filed under his homestead rights on a quarter section which now lies along the north border of the town. Here he has resided ever since, building a large comfortable frame dwelling. He early began the livery business in a small way in the barn on his homestead, and, as business grew, he was compelled to build the large barn in which his business is now housed. He keeps a good grade of horses on hand at all times, and a variety of vehicles suitable for any and all occasions. Mr. Briggs is of down east Yankee stock, his birth having occurred in Brandon, Vermont, February 29, 1840, which gives him a birthday but once in four years. His parents, David and Amelia (Dinsmore) Briggs, migrated to Van Buren county, Michigan, in 1847, and settled on a farm seven miles from Decatur and nine miles from Hartford. Here Davis H. Briggs lived until coming to Nebraska, except the three years he served as a soldier in the civil war. Enlisting at Paw Paw, Michigan, in May, 1861, his company was united with others from several states into the Seventieth New York, known as Sickles' Brigade. After fighting through the seven days' desperate engagements in the wilderness, he was assigned to detached service most of the time in the wagon train. He was mustered out in June, 1864, at New York city, and returned to Van Buren county, Michigan. Since he was a lad of only ten or eleven, he has made his own way, working for his board and clothing at first, and later, as he became larger and stronger, securing places where fairly good wages were paid. On his return from the army, Mr. Briggs farmed on rented land in Michigan until coming west, on the date stated heretofore. In migrating west, Mr. Briggs came, by rail to Stuart and overland from there to his destination. Here for a few years he lived in a sod house with a frame addition annexed, but, like all early-timers, found the sod house the most comfortable in winter. During their first winter they were better protected from the cold than that, having set up their bed in the cave cellar that had an entrance directly into the house. When the time came to build a frame house the lumber had to be hauled across country from Stuart, thirty-five miles distant, a long and weary journey, with but few houses of settlers along the way. Mr. Briggs was first married in Keeler Center, Michigan, to Miss Laura Osborn, to whom three children were born: Millie, now the wife of Fred Dryer of Dakota county, Nebraska; Frank, who is farming one mile east of Naper, where he owns a quarter section of fine land; and Clara, who is now deceased. She was the wife of William Tomlinson. The first Mrs. Briggs died. Mr. Briggs was married a second time, the bride being Rachel Blinkley, of Keeler Center, Michigan, who was born in Baltimore, Maryland. a hole was battered through the roof of his new barn. After enduring the privations of these early days, Mr. Briggs can take life easy, assured that neither he nor any member of his family need ever come to want. Old England, the birthplace of most of the first settlers of the United States, has been giving her sturdy sons year after year since the earliest Colonial settlers began peopling the eastern coast. Nebraska has received a goodly share of English and Canadian settlers, and among the colony of the former who settled in Stanton and Cuming counties, the Pont families were prominent members. Benjamin Pont was born April 2, 1850, in Haddanham, Cambridgeshire, England, about seven miles from Cambridge, the seat of one of the oldest universities in existence. He lived here until he attained his sixteenth year, and then, with a brother, Martin, started for the states to join an uncle, Robert Pont, who had been living for a number of years at Anawan, Henry county, Illinois, and had accumulated quite a snug little fortune. The boys sailed from Liverpool on October 20, 1866, on the "St. Marks" an American sailing ship, which, being a freighter, carried a cargo of chinaware. Its fifty passengers were carried at the rate of three pounds, ten shillings, or about $17.00 each. Rations were issued to them each week, which they were obliged to cook for themselves. The voyage lasted until December 7, when they reached New York. Here the two boys were compelled to wait at Castle Garden eleven days, until their uncle could communicate with them and send their railroad fare, Their sole capital was eleven English shillings. They soon learned that their silver could be exchanged for "shinplasters" (paper money), at an advance of thirty-three and one-third per cent. They reached their uncle's home at Anawan about Christmas day, and remained there about five years. In the spring of 1872, with Samuel Pont, an uncle who had come to America a few years before, they chartered a car to Fremont, by way of Omaha, bringing their horses, cattle and farming implements. From Fremont, they drove to Dodge county, where they spent a year "squatting" on school land, renting some farming land near. In the spring of the following year, they sold their improvements on the school land and moved to Colfax county, settling on a homestead about twenty miles north of Schuyler. Mr. Pont filed on an eighty-acre homestead, and also took a claim on the adjoining eighty, under the Timber Act. After the death of his stepfather, who had filed on a homestead near, he added that to his timber claim and took his aged mother to make a home for him, he being still a bachelor. The timber claims were not proved up until some years after his homestead patent was issued. President Cleveland signed the papers for the first eighty, and President Harrison for the second. Mr. Pont was married at Anawan, Illinois, on January 11, 1877, to Miss Emma Bristol, a daughter of David and Julia (Mumford) Bristol, and a native of Oneida county, New York. They have had seven children, as follows: Grace, (Mrs; E. C. Mechling, Chicago, Illinois); Homer, Myrtle, (Mrs. E. A. Anderson); Carrie, May, (deceased); Ervine, Mable, and Nathan B.
Mr. Pont is giving his children the advantages of the best schools, knowing how he longed for such opportunities when he was a boy. At the time when he came to Nebraska, the prairies were open, and one might ride in any direction without meeting an obstructing fence. His first house was of upright boards and cost but one hundred and fifty dollars, but at one time he would have taken that amount for house, lands and all, just to get away. In common with other settlers, he suffered many hardships and misfortunes at first. Prairie fires and blizzards became mere incidents. For a long time,. the only coffee they used was parched wheat and toasted bread grounds. "Indian flour," the whole unbolted wheat, was in general use in those days, being cheaper and more nourishing than the white flour. One of the first tasks Mr. Pont undertook on his land was to plant trees and orchards. He sometimes gathers now in a single season, three hundred and fifty bushels of apples, besides a great amount of plums, apricots, pears and small fruit. Mr. Pont is an independent democrat in politics, and was formerly a Knight of Pythias. For seven years he was postmaster of a station established at his house, known as Midland. He is one of the most respected citizens in Stanton county, and now, after the years of hardship and privation incident to a pioneer's life he is enjoying his well-earned ease with the satisfaction of seeing his children all well established or preparing themselves for the higher walks of life. On an other page will be found portraits of Mr. an Mrs. Pont together with a view of their home. Mr. and Mrs. Benjamin Pont. Original Homestead of Benjamin Pont, 1873. Residence of Benjamin Pont, Built in 1892 to Replace the Original Homestead. For over the past quarter of a century, the gentleman whose name heads this personal history has been a resident of Boone county, Nebraska, has aided materially in the development and growth of the agricultural section of the county, and is prominent in business, politics, and in a social way. child of James and Catherine Brady, who had three sons and four daughters. Mr. Brady came to Boone county, Nebraska, with his parents, on March 4, 1884, settling on the farm they had purchased northeast of Albion, and was actively connected with farm and stock interests in Boone county until 1899, when he came into Albion from the farm and embarked in his various business enterprises, being engaged in the real estate, loan and insurance business in Albion, and having large and extensive business interests in Boone and adjoining counties in Nebraska. He is the owner of several fine farms in Boone county, and has other land interests in Nebraska. He is a successful man, enjoying the confidence of his business associates, as well as his many friends throughout the state. Mr. Brady is prominent in politics, being chairman of the democratic county committee. In the fall of 1902, he was the nominee of the democratic party for the state senate, and was elected by a handsome vote, serving one term, being the leader of the minority in the upper house. He is a progressive man along all lines that took to the upbuilding of his home town, county, or state. On June 20, 1902, Mr. Brady was married to Miss Teressa Brown of Albion, Nebraska, who was one of the old settlers. Mr. and Mrs. Brady have a family of six children: Catherine, Thomas F.; Alice; Agnes and Albert, who are twins; and James T., junior. They are an excellent family and enjoy the respect and esteem of many friends, and reside in their modern residence in town. William Jacobsen is entitled to a foremost place among the farmers of Wayne county whose biographies are given in this work. He is a man of stability and integrity and has always taken an active part in promoting the general welfare of his community. He is a native of Holstein, Germany, born in 1878, and a son of August and Anna Jacobsen. Mr. Jacobsen received a somewhat meager education in the public schools of his native land and left home when about twelve years of age, sailing from Hamburg to New York on the steamship "Columbus." The Jacobsen family started west and located in Omaha, where they spent several years, coming to Wayne county in 1892 and purchasing the farm now occupied by William on section twelve, township twenty-seven, range three. This place was formerly owned by F. Bishop and was partially improved. Mr. Jacobsen has made many more improvements on the place and is engaged in general farming and stock raising. William Jacobsen is one of the younger farmers in the county and is progressive in his ideas and enterprising in his methods of carrying on his work. The place shows the result of hard work and thrifty management and is one of the pleasant homes of Wayne county. F. W. Lehmann, a representative agricuIturalist of Stanton county, is a substantial and reliable citizen and has won success through untiring energy and industry in following his chosen work. He is one of the class of men whose economy and thrift have made possible the present prosperity of his state, as the basis of wealth there has been the farming population. It is important that the men who control farming interests should be men of sterling integrity and worth, and should work for their own advancement in a way that insures the welfare of their locality, and such men were the early settlers of Nebraska. Mr. Lehmann was born in Wisconsin in 1850, and is a son of D. F. and Henrietta Lehmann, both natives of Brandenburg, Germany, who came to America in a sailing vessel and became early settlers of Wisconsin. In 1869, they left that state and came to Madison county, Nebraska, where they took up a homestead and the father purchased realty holdings from a fur trader. They made the journey to their new home with a team of oxen, the journey consuming seven weeks, and four days. They spent several years in a log house which the father erected, and then built a comfortable frame house. During the early seventies,they were greatly troubled by the depredations of the grasshoppers, and often had to fight prairie fires, enduring the trials and privations incident to pioneer life. They were obliged to go as far as Columbus or Omaha to market. .In 1880, F. W. Lehmann came to Stanton county and purchased his present home. He had been reared on a farm, and received the educational advantages that could be given him at that time in Madison county. He was married in 1887 to Miss Martha Biehle, and they are the parents of eight children: Eles, Alma, Mary, Adolph, Hilda, Otto, Henry and Martin. were settled on their new home one ox died leaving but one and Mr. Biehle went to a place north of Norfolk and purchased a mate for it, so that he could cultivate his land, paying one hundred dollars for the animal. His children picked plums and he hauled them to Omaha to sell, thus securing the price of a plow. In the early days he had to go to Fort Calhoun to mill, and one time the trip consumed three weeks, when he went to market. While the father was away, their provisions gave out and Mrs. Biehle made cakes of bran and milk, which she baked for her family. While they were living on this sort of fare an Indian went by and asked for something to eat, and Mrs. Biehle gave him some of her bran cakes, crying because she had nothing better to offer. The good-natured Indian said the children could not live on such fare, and tried to help the family by bringing them some wild duck eggs. By the time the father arrived home, three days later, his family had about given him up for lost. The trials of the early days were finally over and the family began to prosper and enjoy more of the comforts and conveniences of modern life. Mr. Lehmann as a boy participated in the work and hardship usual to a farmer's boy of the times, and grew to robust manhood, a sturdy pioneer youth. His first purchase on his own account was of a right south of Norfolk Junction, and later he procured his present home, which is located on section eight, township twenty-three, range one, where he has brought his land to a high state of cultivation and made all possible improvements. F. J. Michael, one of the old settlers of the region where he chose his home in the early days, occupies a good home and valuable property in section twenty-two, township twenty-six, range eight, Antelope county, Nebraska. He has done his full share in improving his locality, add is well and favorably known throughout this part of the state. Mr. Michael is a native of New York state, where he was born on May 16, 1867. His parents were German. His father, Ernest Michael, married in Germany, Miss Dora Broker. Mr. Michael came with his parents to Antelope county, Nebraska, and located southeast of Oakdale, for one year. Then they took up a homestead southwest of Clearwater, built a dug out in which they lived for a few years, and then built a log house. Here the family experienced many vicissitudes and dangers, coming at a time when the country was in its wildest state. Many dangers and hardships beset this handful of sturdy people who braved the unknown wilderness to seek their fortunes. Our subject's father went to Sioux City, and procured work to earn enough money to support his family, as at first it was hard to get a start when one had no money. At that time Columbus, Wisner and Yankton were the nearest market places, being seventy-five miles away. Mr. Michael was united, in marriage in 1898 to Miss Minnie Shores. Mr. and Mrs. Michael have one child, John, a lad of thirteen years. Mr. Michael has spent nearly all his lifetime in the county in which he now resides, having lived here some forty years, since 1870, and has seen every phase and change of Nebraska life. His present place, which comprises two hundred acres, he has lived on since 1902. His childhood days were passed on the rolling prairies of untilled ground, when dangers of which he scarcely realized, beset the family; when hardships and many privations stared them in the face. But those days have passed into history, and our subject now enjoys a comfortable home and the period of modern civilization, and is happy in the possession of his home and family, and a wide circle of warm friends and acquaintances. Herman Rehfeld, a successful and well known farmer of Pierce county, Nebraska, lives on section twenty-three, township twenty-seven, range four, where he has spent nearly all his life, having lived there thirty-one years. He has done his full share in the development of the agricultural interests of the community where he lives. Mr. Rehfeld was born August 14, 1876, in Stanton county, Nebraska, and in 1879, with his parents, came to Pierce county, Nebraska. His parents first built a sod house and planted twelve acres of trees, and later took up a timber claim. Our subject's father, a native of the province of Pommerania, Germany, was born in 1847, and died in 1880; the mother was born in 1846. They were married in 1870. Our subject, Herman Rehfeld, was married September 1, 1901, to Miss Anna Zeigfeld, born August 6, 1882. They have had two children born to them, whose names are Johanna and Albert. Mrs. Rehfeld's father, also a native of the province of Pommerania, Germany, served in the Prussian army from 1871 to 1873. He learned harness-making in Germany and owned a shop of his own in Plainview. He sailed from Bremen, on the steamship "Wesar," and landed in Baltimore. He was married to Miss Mary Vosbeck, who was born in 1850. Our subject, Herman Rehfeld, is a member of the German Lutheran church, and votes the democratic ticket for the state, but in the county elections he votes for the man. and blood. He is about the first settler in that portion of the county, and through strict attention to business, thrift and good management, has accumulated a large property and is widely and favorably known throughout the entire region. Mr. Haggerstrom is a native of Sweden, born August 25, 1855, and spent his boyhood in that country. He was married there in 1877, to Johanna Fredericka Vickstrom, and with their child, Hulda, came to America, arriving in Howard county, Nebraska, in August, 1879. Mrs. Haggerstrom died while the family lived in Dannebrog, her death occurring April 13, 1880. Shortly afterwards Mr. Haggerstrom went to Wyoming, where he remained for eight months, then returned to Howard county, and in October, 1881, homesteaded on section six, township sixteen, range ten. May 20th of the following year he was married to Annie Marie Lindberg, at St. Paul, the ceremony being performed by Judge Anderson, who also gave a fine wedding dinner in their honor, the occasion being one of the well remembered social events of those days. Our subject has been most successful in his different enterprises, principally carrying on a stock and grain business, and he has added to his original homestead until he now owns eight hundred acres of fine land in this county, as well as a quarter section in Greeley county. The father and mother of our subject both died in Sweden, and John I. was the second child in their family of four. He was early taught to do all sorts of hard work, and never had the advantages of education, as he was early obliged to go out to work, in order to help support the family, but by experience and observation he has become possessed of a good business education, is wellread and keeps abreast of the times in all current matters in the state and national affairs. Mrs. Haggerstrom's father, Matthew Lindberg, was born in Sweden, and came to America in 1884, after which time he made his home with Mr. and Mrs. Haggerstrom until his death, December 13, 1909, aged eighty-three years and six months. Mrs. Lindberg died in Sweden in 1858. Mr. Haggerstrom's family consists of the following children: Hulda, the only child of Mr. Haggerstrom's first marriage, wife of Gus Dahlberg, living on a farm adjoining our subject;. Dagny, who is the wife of Arthur Larson, also living in Howard county; Albin, married and living on a farm near his father, as does Oscar and his family, while Ellen and Gust, the youngest children, live at home. All are bright and intelligent young people, filling honorable places in the community. Lillie, the last child born, died June 1, 1892, aged two months. Hans L. Clement, one of the successful young farmers of Valley county, Nebraska, is a son of an early pioneer in eastern Nebraska. Mr. Clement resides on the old homestead in section twelve, township twenty, range fourteen, with whom the venerable father, Hans Clement, senior, makes his home. Hans Clement, senior, was born in Denmark, August 24, 1826, where he received his education and grew to manhood. On October 10, 1853, he was married to Serena Maria Christensen, to whom six children were born; Ludwig, Anna, wife of William Mellerup; Frederick, deceased; Mary, now Mrs. Merzel Goodrick, of Ord; Laura who married F. E. Thorn, and Hans. In 1879 Mr. Clement, the elder, came with his family, to the United States. They first settled in Iowa, remaining until the. spring of 1883, when they came to Valley county, Nebraska, by "prairie schooner," Anna alone of the family remaining at Iowa. The father homesteaded the northeast quarter of section twelve, township twenty, range fourteen, where he still resides with his son Hans. Mother Clement died on the home farm in 1898. All the children live in Nebraska, except Louis and Anna, who live in California. Mr. Clement and family are to be classed with the old settlers of Nebraska, and are one of the pioneer families that still hold the old homestead farm. Hans L. Clement, junior, was born in the village of Lundsgord, province of Schleswig, Germany, May 11, 1868, and is the youngest of six children in the family of Hans and Serena (Christensen) Clement. Mr. Clement came with his father and family to the United States in 1879. Coming to Valley county in the spring of 1883, the elder Clement rented two years and then flied, on a homestead about 1885, on which the son now resides. Mr. Clement was married in Ord, December 17, 1898, to Miss Elvene Fogt, a native of Wisconsin, a daughter of John Fogt, who was one of the pioneer settlers of Valley county. Mr. and Mrs. Clement are the parents of three children, namely: Olga, Othellie, and Lee. Mr. Clement has always been active along all lines for the advancement of his home county and state, and has served as township clerk of Noble township for a number of years. He is a young man who has made a success of farming and stock-raising, having about eight hundred acres of Valley county land. He is an independent in politics and a memeber [sic] of the Order of Ben Hur. The Clement family, like most pioneers of Nebraska, lived for a time in a sod house, their first frame dwelling being constructed about 1888. Deer were still to be seen on the open prairies, three of which Fred Clement brought down with his rifle to supply the family with fresh meat. substantial residents of the locality, is the owner of a valuable estate in section one, township twenty-four, range two, and until his removal to Hadar, Pierce county, was surrounded by a host of good friends and acquaintances, who greatly regret his removal from the country. Mr. Huebner is a native Nebraskan, his birth occurring August 20, 1869, and he is a son of August J. and Louisa (Conrad) Huebner, both natives of Germany. The father came with his parents to America when he was but four years old, they embarking on a sailboat and were on the water seven weeks. After landing in the United States, the family went to Wisconsin, where they lived for three years. In 1866 our subject's father, with a colony who had forty-seven wagons and ox teams to haul them, came to Nebraska and settled north of Hadar, Pierce county; they were the first white men to settle in that part of Nebraska. The colony was eight weeks on the road, having to stop on their journey and build bridges before they could cross the rivers. Our subject's father lived in Pierce county three years before its organization, when it was in its wildest and most unsettled state. When he took up his homestead, he first built a log house, which remained the family residence for thirty-nine years. The first winter he lived in this country, thirty-one head of buffalo wintered north of his homestead, and deer and antelope were also plentiful in those days. Our subject, with his father, helped many times to fight prairie fires on the western frontier, and on many occasions they barely escaped with their lives. The grasshoppers were a great source of anxiety in the early seventies, destroying the entire crops of their locality for several seasons, leaving nothing but bare ground where a short time before were growing fine and promising crops. In the memorable blizzard of 1888, our subject's father lost considerable stock. All these losses and dangers made it very hard for the new settler on the western frontier, but were braved by those sturdy sons, who were later enabled to enjoy in peace and comfort the success they so richly deserved. In 1893, Mr. Huebner, our subject, came to Madison county, Nebraska, taking up a homestead of one hundred and sixty acres of land in section one, township twenty-four, range two; on this land Mr. Huebner has a, fine residence and five thousand trees. He is well liked in this community, as a man always ready to do all in his power to further the best interests of his county and state. 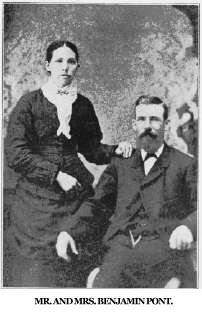 Mr. Huebner was united in marriage December 11, 1893, to Miss Annie Sanne, a native of Germany, and Mr. and Mrs. Huebner are the parents of nine children, a fine family: Hattie, Etta, Tillie, Emma, Mabel, Rosa, Henry, Reuben, and Royal. Mr. and Mrs. Huebner and family enjoy the respect kind esteem of a large circle of friends and acquaintances. They are members of the Lutheran church and Mr. Huebner is a democrat. Henry Schilling is one of the leading citizens of Greeley county, and there he is respected alike for his industry, ability and native force of character. Never afraid of hard work, he has endured the toil of the early days, and now in his old age has retired from active management of his large estate and is enjoying life in his beautiful and comfortable home just outside the limits of the city of Scotia. Mr. Schilling was born near Oswego, Kendall county, Illinois, on the 17th of March, 1848. He was the third of seven children born to John and Hannah (Heiser) Schilling. The parents were of German birth, but both had come to this country in their early years and lived to enjoy the fruits of their early toil. The father died in 1895, having nearly attained the allotted span of life, seventy years, but the mother remained hale and vigorous until February 23, 1904, when she passed away at the advanced age of eighty-four years. Out of their large family, only three remain, the subject of our sketch, and two brothers who reside in Indiana. Mr. Schilling grew to manhood in Illinois, and received his education in the common schools of that state. After attaining his majority he engaged in farming. On May 5, 1870, Mr. Schilling was united in marriage to Miss Sophia J. D. Meyer, a native of Hanover, Germany. Ten years later, Mr. Schilling and his little family went to Lake county, Indiana, and he farmed there for two years. At the expiration of this time, he decided that the chances of ultimate success were better in a newer country, where his children might have the opportunity of growing up with the country. Accordingly, in the spring of 1882, he, with his wife and three children, cattle to Greeley county, Nebraska, where he purchased a quarter-section of land in section thirty-one, township eighteen, range eleven, from the B. & M. railroad. This place was the home of the family for a number of years, during which they all labored for the good of all. One improvement after another was put on the farm or its buildings, until everything was made as comfortable as possible. Then in 1900 Mr. Schilling purchased seventy-two acres joining the city limits of Scotia and built a fine house, where he now lives.